While voting is being held in 18 constituencies in Jammu and Kashmir, Jharkhand is polling for seats in the second phase. In a rerun of record polling in the first phase, a 71 per cent voter turnout was registered in the second phase of incident-free Assembly elections in Jammu and Kashmir on Tuesday as the electorate in the 18 seats again ignored boycott call by separatist groups. And A total of 65.46 per cent votes were cast in 20 of the 81 assembly seats in second phase of the five-phased state elections today. Election commission officials said the figure in J&K could go up by one to two per cent once the final tally is available. numbers to go up by 1-2 per cent further,” Deputy Election Commissioner Vinod Zutshi told reporters in Delhi. incident” took place and the entire event was peaceful. 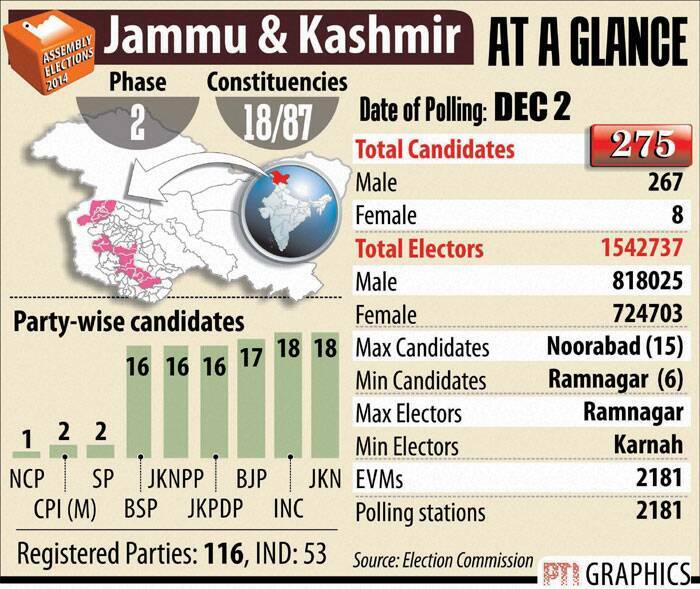 Of the five districts, two were in the Valley and three in Jammu. While in Jharkhand, the polling also concluded peacefully in all the constituencies, Chief Electoral Officer P K Jajoria said. Re-polling was also held peacefully at one booth in Garhwa seat and two in Chhatarpur constituency. Tuesday’s poll percentage in J&K, the Deputy EC said, is higher than the figure of 61.04 per cent polling during the 2014 Lok Sabha polls and 68.79 per cent recorded during the 2008 Assembly elections. cent), Poonch (75 per cent), Kupwara (68 per cent) and Kulgam (above 60 per cent). He said the weather was “very supportive” during the polls and there was no snowfall. 11 other sitting MLAs were in the fray. # Two villages in Kulgam Assembly of south Kashmir constituency have en masse decided not to take part in the democratic process alleging discrimination in development and harassment by security forces. 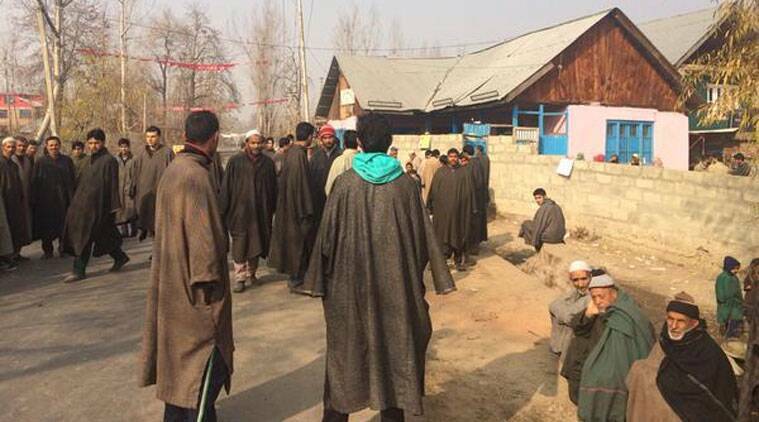 #In J&K, during the first hour of polling, several people including Kashmiri Pandit migrants were seen standing in queues outside polling stations to exercise their franchise. #About 16.32 per cent turnout was recorded in the first two hours in 20 Jharkhand Assembly constituencies across seven Maoist-hit districts. #According to official figures, Lolab Assembly segment recorded the highest turnout of 10.5 per cent in the first hour of polling in J&K..
#Nearly five per cent voter turn out was recored in the first one hour in the second of the five-phase Assembly elections in Jammu and Kashmir. #Out of the 18 assembly seats going to polls on December 2, nine segments are from the highly militancy-infested districts of the Jammu region, including Poonch and Reasi. #In this phase, RJD and JD(U) are not in the fray in Jharkhand Assembly polls. 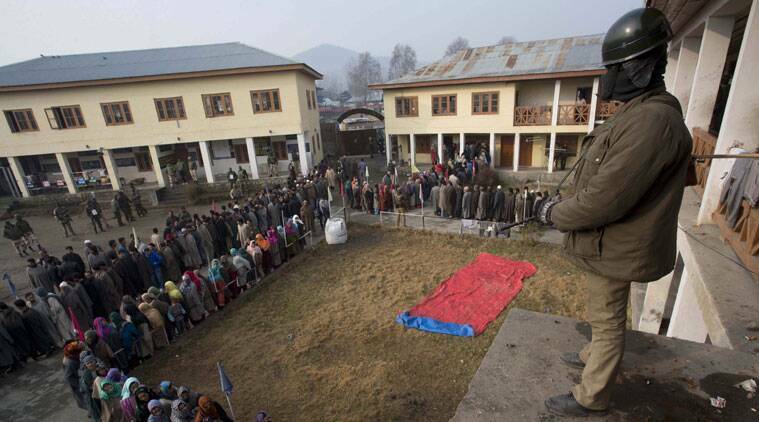 #A total of over 12 lakh voters will exercise their franchise at 1,900 polling stations in second phase in J&K. #An electorate of 44,31,900, including 21,72,982 women, is eligible to vote in 5,048 polling stations across seven districts of Jharkhand. #The polls will seal the fate of 223 candidates Naxal-hit areas Jharkhand. # In J&K, the polls will seal the fate of 175 candidates, including deputy speaker, four ministers and 11 other sitting MLAs, amidst tight security in Kulgam and Kupwara districts following attacks on sarpanches by militants. #In J&K, Handwara in north Kashmir Kupwara district will be the focus of attention as separatist-turned-mainstream politician Sajad Gani Lone is making debut after losing Lok Sabha polls in 2009. 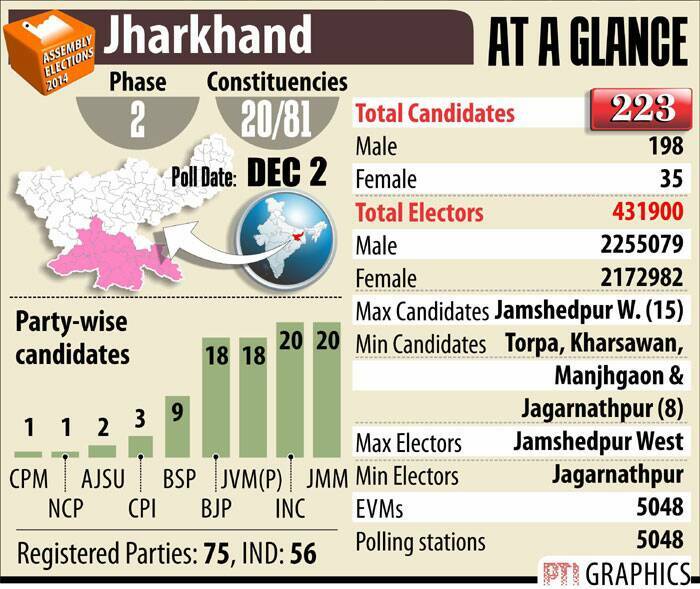 # In Jharkhand, polling began at 7 am in all 20 constituencies. While it will end at 5 am at Jamshedpur (West) and Jamshedpur (East) seats, the exercise will end at 3 pm in the rest of the seats. # People have by and large so far stayed indoor due to cold weather and heavy fog engulfing the Kashmir valley. # The polling is being held in 20 Maoist-affected constituencies amid tight security in Jharkhand.